Your most loyal participants dream of racing in Kona – many train countless hours, sacrifice precious time away from family and friends for the chance to qualify. For those lucky few that do end up qualifying and racing, they tend to train even more, sacrifice more time away, and then spend lots of money to spend 7-10 days in Kona. These athletes deserve the race they have dreamed of – every aspect of it. This is not what they dreamed about when they imagined competing at the Ironman World Championships. 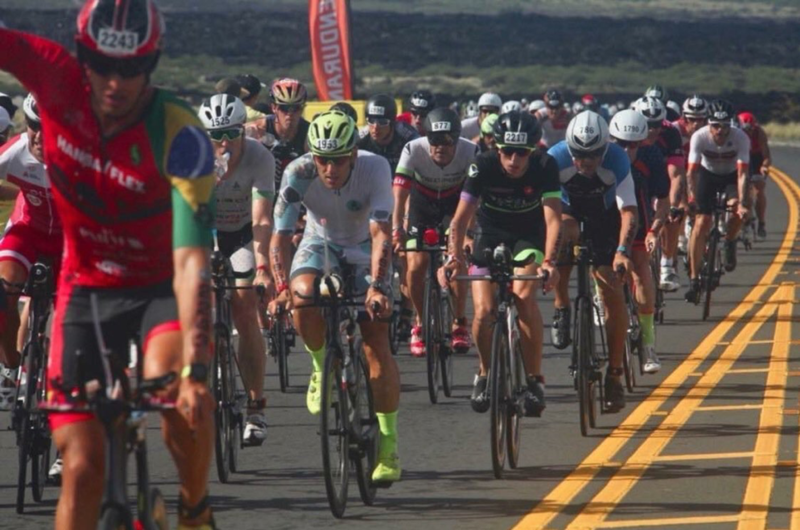 I have personally raced in Kona in 2011, 2014, 2015, and 2017 – in 2018 I was spectating for the first time and while the winds impacted the drafting significantly – this was not the first time. I have witnessed drafting up and down the Queen K every time I raced. In 2014 and 2017, I was lucky enough to be towards the front of the race with tons of open road, and sadly athletes were still drafting. With open road, drafting is unacceptable and, on the athlete, – but the packs that we see in the first 40 miles every year are not a result of poor athlete choices – it is a result of the race set up. Therefore, we felt the need to use our experience and connections within triathlon to SPARK CHANGE. To stop sitting around complaining about it, only to take the next Kona slot we get. Sure the best way to spark change is to simply STOP RACING KONA. But I think we both know that isn’t going to happen – and I believe Ironman also wants a safe and fair race for its athletes in Kona and all Ironman races. So we surveyed over 350 Ironman athletes to get their perspective and ideas on how to address the issues in Kona. Many requested that we help solve issues at the non-Kona races (Ironman Texas 2018 was noted many times). We also interviewed a handful of the Marshalls from Kona races to get their perspective and thoughts on the matter. The later was eye opening to say the least. We then developed hypotheses around our recommended changes and our data scientist, John Matson, helped to validate these recommendations statistically. Women deserve a separate wave start from men. A two day format would be a very challenging endeavor for many reasons. So we eliminated this option. Plus Ironman just added more athletes in the 70.3 2 Day format so the issues would like just be worse. Age groups need to all start at the same time. So the first person to cross the finish line in their respective age group is the winner. Wave Starts allow for the excitement in Kailua Bay and keep a “mass start” feel. We also assumed Ironman is fine with pushing final start wave to 7:20 as they did in 2018. MOVE TO WAVE STARTS – yet keep mass start feel by limiting wave starts to 4 groups. This will divide the participants equally. 3 Males waves and 1 Female wave. All 10 minutes apart. MORE QUALIFIED MARSHALS – our findings in talking to the race marshals were alarming. The disconnect between moto and marshal was staggering. The marshaling for a World Championship race must be a more organized process – if we can get qualified medical professionals to volunteer each year in the Medical Tent, surely we can get qualified, training motos and marshals to referee the Bike Course. For all other Ironman races, while there were complaints about rolling starts, it does clearly help with drafting. There were some good suggestions around a Kona qualifying wave before rolling start begins to allow all athletes vying for Kona spots to start together in a wave and monitor them closely on the bike course. That was an interesting idea worth testing. Other than that, the main complaint was the lack of marshals leads to athlete drafting resulting in unsafe racing conditions. Even the mid-to-back pack complained that even though there weren’t going for a Kona slot, they still wanted a fair and safe race environment, which they, of course, deserve. Our analysis of timing data from the past five years indicates that a move from the current format to the proposed four wave solution is effective at eliminating situations where athletes exit T1 without ample space to honor the 12-meter draft zone. By separating participants over four waves, the peak of the time distribution can be spread, providing a steadier flow of athletes beginning the bike leg. To ensure this proposal is effective, we modeled the performance using recent results. By analyzing the average bike speed of each athlete, we are able to estimate how much time gap is required to maintain a legal following distance to the rider in front of them. With this data we determined the number of athletes forced to draft, without a legal gap for them to fill within 20 seconds on the road (+/- 10 seconds). Our model shows that this proposal is effective at eliminating nearly all scenarios where congestion forces athletes to ride within the draft zone. We recommend that Ironman get serious about how their events should be marshaled. A few marshals that we interviewed were so upset at the Kona conditions they said they would never marshal again. These are volunteers! This entire process needs a compete revamp for a World Championship race. Without knowing the details of how the Med Tent is staffed each year, we felt there was something to be learned from that process as there are doctors and nurses that come every year to work this event. Thus, what would it take to get licensed, qualified USAT marshals and motos to referee this prestigious World Championship event? Work directly with USAT to identify qualified marshals and motos to work the event. Offer a stipend for them to come to referee the Ironman World Championships. Even airfare reimbursement would likely be enough. It is Hawaii, after all. Pair them with a moto that has also been through USAT and Ironman training. Pair them well in advance of race day and require they do a pre-race ride together. Both moto and marshal must have an ear piece to communicate during the race effectively, one of the biggest complaints were heard was the lack of communication between them during the event. Ensure there are enough marshals to adequately monitor a 2200-2500 person race. I believe Ironman wants to do the right thing here and put on fair and safe races for athletes, especially the iconic Ironman World Championships in Kona. I have spoken to Andrew Messick directly and know they are considering changes. But when a race will always sell out and rolldowns are slim, they will only really NEED to change if athletes DEMAND CHANGE. So we have taken it upon ourselves to do the work for them. These recommendations are straightforward and simple. So if you AGREE with our thoughts – please share with your triathlon friends, clubs, teammates and of course tag Ironman. I expect we will see change if we all demand it. We deserve better. They know this as well. So lets give them a little push to make change happen for us all.